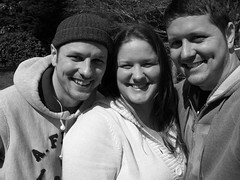 Pick of me and the bros at Golden Gate Park. I had not seen Nicky in about 3 years. We had a lot of fun (regardless of my stomach, STUPID STOMACH) and spent most of our time just hanging out and being together. Plus, I got to spend some time learning about video podcast production. Love you guys! what amazing people you are. love you. what are the odds that i google you and find your own page after i get your message from classmates.com. check your classmates.com account.